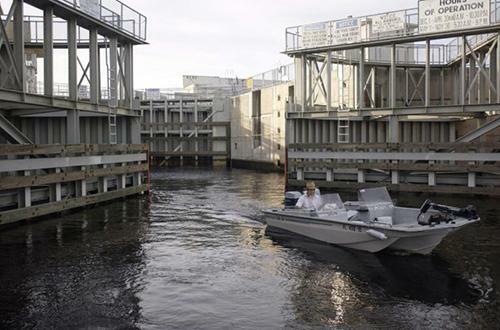 West Palm Beach, FL – Today, the South Florida Water Management District (SFWMD) opened the gates of the S-193 navigation lock at Taylor Creek to assist with flood control north of Lake Okeechobee. As a result of this operation, the lock will be closed to boat traffic until further notice. Tropical moisture has already brought an average of more than 2 inches of rain across SFWMD's 16-county region since Sunday. The S-133 Basin, which includes Taylor Creek, has seen some of the heaviest rainfall so far with 4-6 inches of rain. SFWMD meteorologists are forecasting additional rainfall in the coming days. For more navigation notices and schedules for SFWMD locks, visit www.sfwmd.gov/navigation.